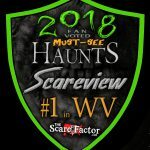 Scareview is a Haunted Attraction located in Saint Albans, WV. Team Zombillies reviewed this attraction on September 23, 2016. 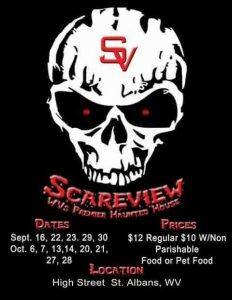 For their 2016 season, Scareview has literally risen from the ashes and they are back with a vengeance! During the off-season, their haunt home (an authentic schoolhouse) became victim to a fire that ruined portions of the building, including all of their electrical wiring. Since then, they have basically gone in and completely redone the entire haunt and we could tell! We didn’t see many scenes that were present last season so, if you’ve been here before, you need to go back because they have many new sights to show you! They have also worked around the fire damage and even used it in one of their scenes so you can see it before exiting the haunt! Scareview covers a large variety of villains and scares, so you never know what you may see here. From spiders, clowns, zombies and witches to a crazed doctor, a laboratory, a REAL snake and more, there’s a little something in here to make everyone’s skin crawl! Don’t forget to bring a canned food item with you to get a discount on your admission, which makes this attraction only $8.00! This is one of, if not, THE lowest priced haunts we visit, so head on out to this old schoolhouse, get in the chicken coop and have a seat because “it’s on” from there! Be sure to watch out for Jason as you make your way through; he’s already hung Michael AND Freddy and he’s coming for you next! This must be one really fun haunt to work at because we were told they had over 400 volunteers show up to work this year! Now, the house is generally set up for 75 actors and it seemed pretty full when we were there; some scenes had up to 6 actors and actresses in them at one time. We ran into quite a few cast members outside the haunt during our visit, some who we also saw later inside, that were among the most believable on the property! As soon as we arrived, a chicken had us picking up human legs off the ground as a distraction for the Jigsaw puppet, who then came after one of us with his quick-starting chainsaw! The characters outside also had some of the best dialogue on property, in addition to the doctor, the girl with the gas can and the lady with the snake. The many zombies’ and other non-speaking ghouls’ noises and growls were realistic, which enhanced their believability, but it seemed like many of the other characters used repetitive dialogue and a lot of high-pitched screaming, which made it hard to hear those who were trying to talk (or plead for mercy). This was only their second night open, so we’re sure some of the newer cast members will get the hang of things and the entire crew will continue to improve as the season progresses. Other characters that stood out to us were Chewie, the General, the pig, the windigo (who used the led lighting around him to enhance his appearance) and Leatherface who was showing us his prized facial piece and going on and on (in Sawyer language) while another Leatherface prodded us with a chainsaw in the next scene. We came across so many characters that it was difficult to keep our eyes on all of them long enough to notice the entirety of their outfits. They did range quite a bit in quality; some of the costumes were a lot more detailed, distressed and more complete than others. Several of the characters had very impressive makeup, including a female demon who helped spill the rules out to our group, the characters in the finale of the haunt with charring and burns and the Queen of Hearts who had cards protruding from her skin (although, the rest of her attire was of unmatched quality). Many masks were used, including several very high quality silicone pieces such as a guy with an exposed brain, a chicken and several other beasts. Other notable costumes included Jason, the Grim Reaper, the scarecrow and both Leatherfaces who all also had the appropriate build to bring out the intensity and realism of those characters! Our GPS basically took us right to Scareview, which sits atop a hill overlooking the road we came in on, and friendly parking attendants guided us to the best available spot in their free parking lot. The attraction was fairly easy to navigate and there were plenty of additional staff members all over the grounds if any questions or concerns were to arise. They offer concessions for those who get the munchies and we also noticed a tarot card reader near the clown-decorated ticket booth. As we waited our turn there were quite a few monsters mingling with the crowd to keep everyone entertained and one clown brought out a giant hula hoop to use (which was rather funny to watch). Once inside the attraction, we did noticed some uneven flooring (so watch your step) and there are multiple sets of stairs you must traverse so be prepared for that as well. This building is the perfect location for a haunted attraction! It’s an old, dilapidated, brick schoolhouse that sits alone atop a hill. Multiple colored lights cast their colorful glows on the front of the building which really added an additional touch of spookiness. Some music and screams could be heard escaping the walls of the school, but it was rather quiet outside except for the characters roaming about and the intermittent chainsaw. A snow machine was decorating their lawn and sidewalk to try and help take you into their crazy, fantasy world! Many of the effects at Scareview have mostly been created and built in-house by the masterminds behind this haunt! Some things have been purchased too but, for the most part, you’ll see many unique things that you won’t see anywhere else. Music and sounds, when heard, consisted of hard rock music for increased intensity, various ambient audio tracks, howls, horns, an air raid siren and more! Effective lighting aided in making it harder for us to spot some of the monsters and, thus, had us sidestepping at times. One part of the attraction that stood out to us the most was a medical scene where a female seemingly gets part of her leg chopped off! This is a large building and there are so many things to look at here that you would have to go through several times to catch it all, but some of the other effects we noticed include bones, a giant skull, a side-to-side shifting floor, a spongy floor, a vehicle IN the schoolhouse(how did they get that in there?) trees, twigs on the floor, corn, a guillotine, human cages, an electric chair, chainsaws, an electrical box mishap, a real snake and a vortex tunnel that’s complemented with a unique lighting technique that we’ve never seen before to date! This attraction does not stick to one certain theme and, instead, likes to include a huge variety so they can try to cover everyone’s fears. From a mad doctor, a laboratory, a glowing spider’s nest, a chicken coop and a section of a cornfield to a graveyard, several movie characters and a werewolf pack confrontation, we’re sure you will see quite an assortment here. The folks at Scareview stirred up quite the variety of frights and didn’t hesitate to serve them up during our visit! Many of the crew members were very torturous and attempting to harm others in their scenes, so there were definitely some times where we didn’t stick around long! One of the first things they did to us was lock us in a chicken coop while two children actors (both very believable by the way) taunted us with menacing dialogue and stares while the Jigsaw puppet continued to poke a chainsaw in through the cage at our heads! Now that’s a way to start out a haunted house! We also witnessed a poor escapee get snatched up in front of us and carried off. Some good hiding spots were noticed (mostly from behind walls and curtains), but there was also one costume that we were standing right next to and didn’t even see it because of how well it blended in with what was around it! Things got really suspenseful when the Creeper revealed himself as a silhouette walking towards us from beneath a giant skull, then he would disappear and randomly reappear from a different direction. We were constantly checking behind us after that wondering where he went! Another area combined loud music and complete darkness, which made for a pretty creepy spot as well. Other types of scares that we encountered include common fears, a zombie horde, sudden blasts of air and sound, intimidating monsters, several chainsaw attacks and one character that surprised us when he revealed that he was much larger than he appeared at first! 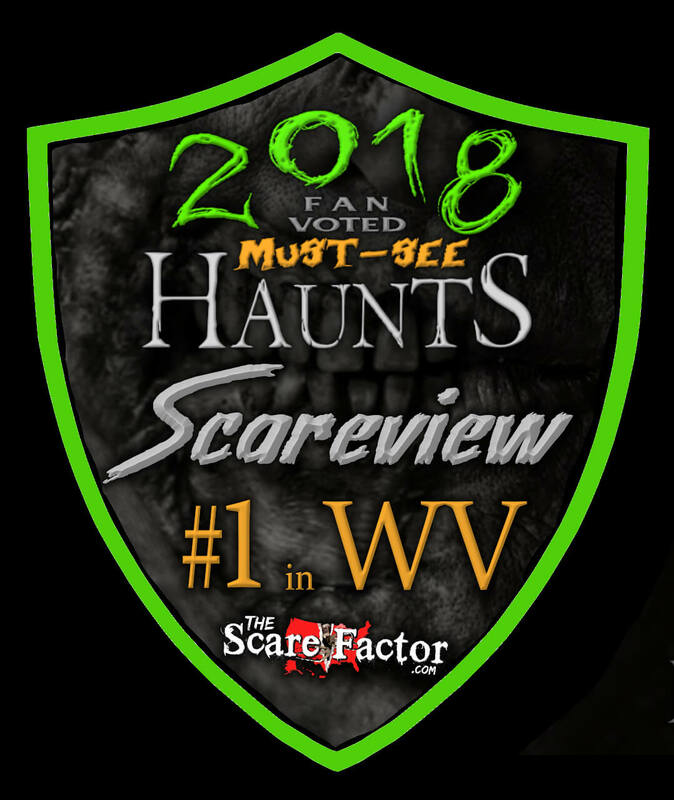 General admission to experience the horrors within Scareview Grave Schoul will cost you $10.00 per person or only $8.00 if you bring a non-perishable canned good! Now that’s a low ticket price! It took our group about 20 minutes to navigate our way through this furious schoolhouse, putting this value at 2 minutes of entertainment per dollar spent if you don’t receive a discount! Our average from all of our haunts from the 2015 season was 1.5 minutes per dollar, so this is a very good deal, in comparison! If you are in the area, we recommend a visit. These folks put this on for a good cause and we could tell that they truly have a passion for haunting. We’ve not been to many haunts where all of the staff and characters (including children) were so happy to be doing what they were doing! This is generally considered a family-friendly attraction, but use your own judgement before bringing any little ones with your group. If you’re able to pay them a visit, you will have a fun time here and hopefully their trickery will get some jumps and screams out of you too! Great fun for families and kids. This is a great thing for our area.